For administrator who manage Google Apps services which have hundreds or thousands of accounts for their organization, allowing non-admin end-users to reset their own passwords seem to be a good way to cut down unnecessary administrative workload and save the time of frustrated people in the domain who is locked out from their accounts. Login to Google Apps Admin console via https://admin.google.com/ by using Google Apps administrator email address. At the Admin console dashboard, go to Security. You may need to expand MORE CONTROLS if it’s not in sight. Go to Basic settings and go to Password Management section. Under the Password recovery heading, click on Enable/disable non-admin user password recovery link to access the Advanced security settings. In the Recovery section, under the Password recovery heading, select and check the Enable non-admin user password recovery box. The Google Apps users in the domain have to set up a recovery phone number in order to use self service user password recovery, where they can use either a voice message or a text message to receive their recovery code to reset the user password. 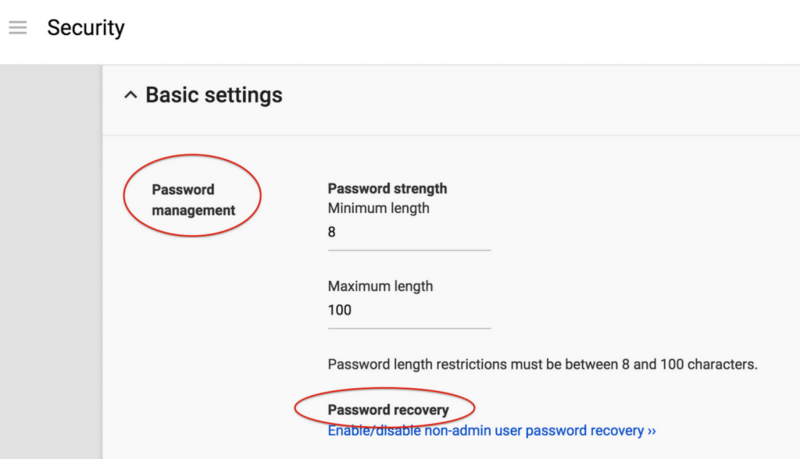 Non-admin user password recovery feature is not available for customers using Single Sign-on (SSO) and Google Apps Password Sync for Active Directory (GAPS). In addition, it’s available only for Google Apps for Work (e.g. paid services). So if you’re using Google Apps Free Edition or Google Apps for Education K-12 (they’re not allowed to enter phone number), you’re out of luck.